Named for the cable works structure at its top. The cable works were implemented in 1901 by young pioneer David Flanigan. 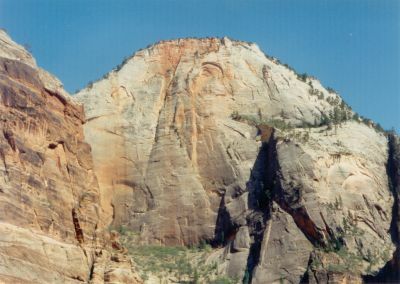 His hope was to fulfi ll Brigham Young’s prophecy that one day timber would come down from the cliff s of Zion Canyon “like a hawk fl ies.” The cable works proved to be a success. The system was used to provide building timber for the pioneers around Zion Canyon. The cable works and a sawmill were in place for over 20 years. Wood for the Zion Lodge came down the cable works.